Starting on April 10, students can catch “In Every Note,” an original play written and directed by Ivan Fuller. The show follows the life of Dmitri Shostakovich, a Russian painist and composer who lived during 1940’s Russia. A one-of-a-kind story is coming to Rider from April 10 to April 14 in the form of “In Every Note,” a play written and directed by the Dean of Fine and Performing Arts, Ivan Fuller. The play follows the life of Dmitri Shostakovich, a Russian pianist and composer who lived during the Siege of Leningrad. The show follows Shostakovich and his relationship with a fictional student named Nadia. It explores the effects the relationship has on the lives of both of the characters’ families and how the political climate encompasses their lives. For Maclean Kennedy, a sophomore musical theater major, who plays Nadia’s father, the politics of the period helped him create a contrast for his character. For Kennedy, the role was easy to step into. The hardest part for Kennedy was developing the arc for some of the more serious parts of the play. “My character begins as a happy, loving father with a slew of comedic jokes and then turns into a father trying to keep his family alive with laughter during a dark part of his life,” Kennedy said. Hill has also been tasked with playing the piano in the show, which he said has been a bit of a challenge. Though this pushed him, it also helped him connect to the character on a deeper level. For the heavy circumstances of the show, it truly was an escape for Shostakovich. It was a brutal time full of death and despair. 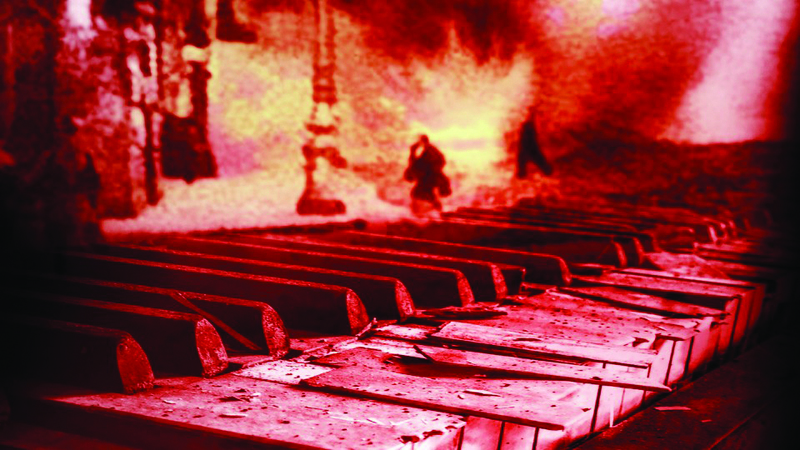 Shostakovich’s music was an escape for the Russian people. Something truly unique about the show is that it is the first time its being fully performed. The entire cast is getting a chance to originate these roles and participate in the development of the play, according to Hill. “It’s something that I don’t think about too often but, occasionally, it hits me and I realize this is something no one has done before,” Hill said. For Kennedy, one of the most helpful aspects of originating this role was the ability to get to work directly with Fuller as the writer and director. “Working with the playwright has been a fantastic experience because I received up-close training with him and understood how he wanted his vision portrayed on stage,” Kennedy said. Kennedy also said that getting to grow with the show has been an interesting experience and a thrill that he will always cherish. Students can check out Bryan Hill and Maclean Kennedy as they take the stage in the first-ever production of “In Every Note,” from April 10 to April 14 in the Yvonne Theater at 7:30 p.m.